Eva is an old uranium mine located 16 km west of the Queensland border in the Northern Territory, it is 50km south of Redbank Copper Mine. 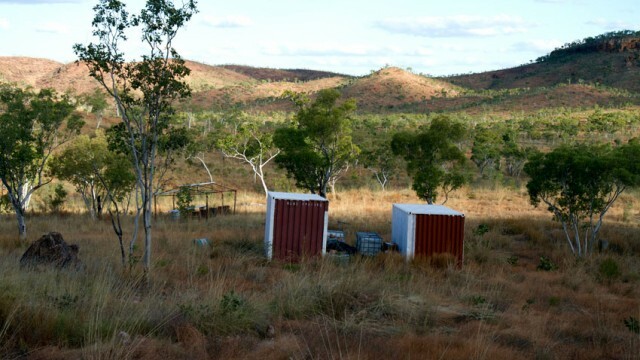 The first uranium find at Pandanus Creek was made by R T Norris in 1955, and the following year Eva Clarke, Norris’ niece, soon discovered the main orebody, simply by picking up yellow pebbles which Norris found to be radioactive. The Broken Hill Proprietary Co. Ltd. (BHP) explored and tested the deposit between 1958 and 1959. A deposit of some 55,000 t of ore averaging 0.56% U3O8 was delineated by drilling, containing some 308 t U3O8 – which was larger than many South Alligator deposits. Due to the remoteness and difficulty of commercial mining at the site, plus the fact that by 1959 no export contracts could be won, the deposit was worked on a small scale by South Alligator Uranium NL from 1960-62, extracting about 3,300 t of ore at a high grade of 1.8% U3O8 (nearly 10 times Rum Jungle). The mine was developed underground to a depth of 83 feet (25.3 metres), with the uranium ore hand sorted to about 306 tonnes of concentrate at the extraordinary grade of 8.37% U3O8 (a total of ~26 tonnes U3O8) and trucked the long distance to Rum Jungle for treatment. Click here to see photographs and read more about Eva Creek.